Amazon's tap-to-order physical buttons are taking over the world, and more brands in the U.S. are signing up. 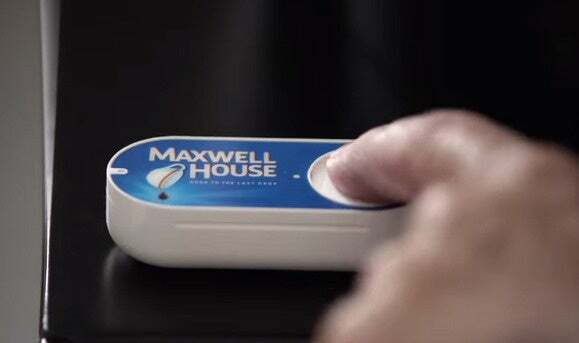 Amazon's putting the pedal to the metal for its Dash buttons, adding another 60 brands to the one-tap ordering system. That pushes the total number of Dash buttons available to U.S. customers past the 200 mark. Some of the recent additions include Airheads candy, Cheez-It, Coke and Diet Coke, Folgers Coffee, Purell hand wipes, and, uh, PoopBags. The new brands come to the Dash program shortly after Amazon expanded it beyond American borders. In August, customers in Austria, Germany, and the U.K. also began tapping their way to shipments of Gillette razors and Whiskas cat food. Amazon’s expansion of the Dash program to other countries and the recent news product additions show the company sees a great future for its buttons—even if they do have a decidedly 1950s sci-fi feel. Amazon says orders from the buttons have increased fivefold over the last year. That's one cryptic statistic, in true Amazon style. It’s impossible to know if that means orders went up from 2 to 10, or 2 million to 10 million. In other words, Dash might be a major success for Amazon... or it might be one of many minor efforts that help contribute to the bottom line. Why this matters: What’s interesting about Amazon’s Dash program is that in a way it mimics Google’s online advertising strategy. One retail order for a six-pack of soda via a Dash button is meaningless, but you put enough meaningless orders together and suddenly we’re talking real money. On top of that, Dash buttons are a Prime-only offering, which encourages more people to sign-up for Prime, which in turn encourages more shopping with Amazon. It’s a virtuous circle made possible thanks to our insatiable need for easier ways to order salty snacks, laundry detergent, and poop bags.